A new waterproof motorized wheelchair that runs entirely on compressed air was unveiled April 7 at Morgan’s Wonderland, a 25-acre theme park in San Antonio, Texas. The park was built specifically for individuals with disabilities, and 10 of these chairs will be available to patrons at the venue’s new splash park, Morgan’s Inspiration Island, when it opens later this spring. Designed, developed and constructed at the University of Pittsburgh Human Engineering Research Laboratories (HERL), the patent-pending PneuChair uses high-pressured air as an energy source, instead of heavy batteries and electronics. The chair weighs about 80 pounds overall and takes just 10 minutes to recharge, compared to eight hours to charge an electric mobility device. 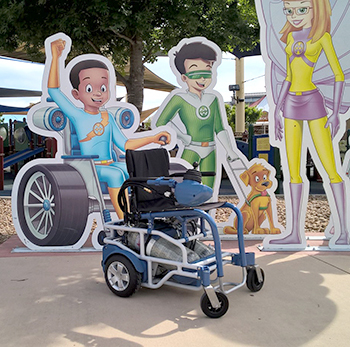 HERL, which is a joint effort between Pitt and the U.S. Department of Veterans Affairs, was already working on a prototype of the PneuChair when it heard from representatives from Sports Outdoor and Recreation (SOAR), a nonprofit organization established by The Gordon Hartman Family Foundation of San Antonio to oversee Morgan’s Wonderland. They asked HERL for help in developing powered mobility for the new splash park. The Human Engineering Research Laboratories (HERL) is a collaboration among the University of Pittsburgh, the VA Pittsburgh Healthcare System, and UPMC Health System. HERL is dedicated to wheelchair and mobility research, specifically by improving the mobility and function of veterans and others with disabilities through advanced engineering in clinical research and medical rehabilitation. HERL also studies robotics in assistive technology, athletics in rehabilitation, assistive living spaces, wheelchair transfer efficiency, clinician training and force and vibration on wheelchair users. Morgan’s Wonderland is one of many initiatives of The Gordon Hartman Family Foundation to promote inclusion and to help those with special needs. Now in its eighth season, the park has welcomed more than a million guests from all 50 states and 66 countries. Admission for those with special needs is free. The splash park, a $16-million, multi-acre, ultra-accessible water attraction called Morgan’s Inspiration Island, will enable family members, regardless of age or ability, to beat the summer heat. The Gordon Hartman Family Foundation was established in 2005 to help San Antonio, Texas, area agencies assist families who care for loved ones with cognitive and physical special needs, with a particular focus on serving children’s needs. The foundation strives to transform lives through annual monetary grants, a resource directory that provides current information on existing services available for a wide range of disabilities, a number of free special events throughout the year and sponsorship opportunities to assist local nonprofits.